Buy Man Afraid of Everything a Coffee. ko-fi.com/getafraid - Ko-fi ❤️ Where creators get paid by fans, with a 'Buy Me a Coffee' button. 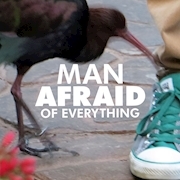 I'm Jed, the writer/audio producer of the podcast "Man Afraid of Everything". Every episode, I do something I'm afraid of. I'm worried about asking for support. So, I have to try it. Independently produced. Thoughtfully crafted. In past episodes I’ve sold a piano on Craigslist, documented a sewage disaster and spent 10 months taking improv classes at Second City Chicago. If you like what I've created so far or if it's helped you in some way, please consider buying a cup or two. That's all! Thank you. Secured Payments. Support goes to Man Afraid of Everything's account. Upgrade Man Afraid of Everything to a yearly Gold Membership with a one-time payment.